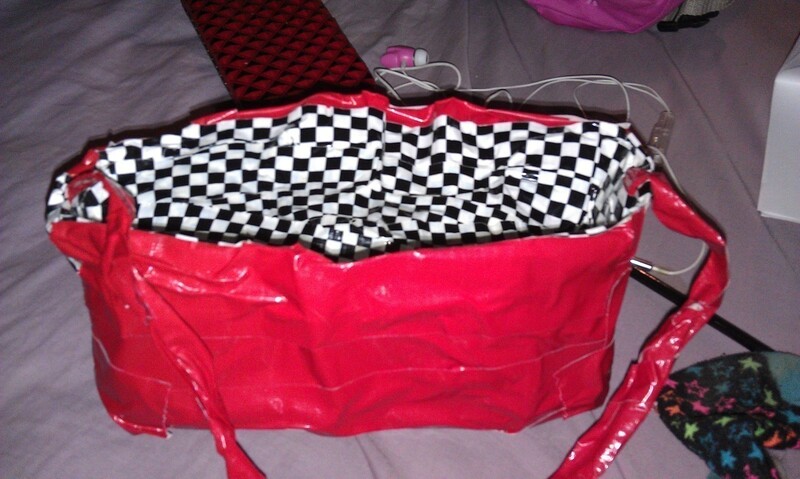 Love duct-tape and purses? Look here to find out how to combine! First, choose the tapes you want to use. For me, I used one solid (those regular tapes that are as thick as the grey duct-tape in Dollar General or any other store) red duct-tape and one checker-board duct tape (those ones you get anywhere, I used it for the inside). Take the outer tape (for me, the red tape) and start ripping long strands off and taping them together (like a picket fence kinda deal). Use about...hmm...say three really long ones, and the tapes on the left and right be gradually shorter. After that, decide on how tall the sides you want them to be. More outer tape, take REALLY long strands, fold them in half (they probably won't be perfect, but be sure that none of the sticky sides are jutting out that badly). When you fold them, leave a little space at the top for the sticky part. Place at the edges of the "bottom". Repeat until you fill all the sides up. Pick the sides up, and tape them to one another (i.e., one strand of tape, tape it to the next strand of tape, and repeat). After a while, it'll begin to somewhat look like a purse. Repeat. After this, cover the outside with the tape, and make it thick. Cover the outside with tape, as well as on the inside. The purse will begin to form better, but make it thick! Next up, decide how you want it to close. Are you gonna make a flap to close it? Are you gonna make it into a sort of messenger bag type deal? For messenger bag: Make another "bottom" and attach it to the back of the purse, but be sure that there is NO STICKY PARTS SHOWING. Add means of closing it (i.e. Velcro, magnet, ect). After this lil guy, cover the inside of your purse with the other duct-tape. YAY! Just cover it with tape :) Add a few layers. Lastly, do you want straps? You wanna swing this baby over your shoulder? Or carry it around like a tote? Just take the outer tape (if you wish) and twist it around. Cover it with tape, so no sticky parts jut out. Attach on the INSIDE of the purse, use a few layers of your inner-tape to stick 'em down!